The Roaring Fork Conservancy is a nonprofit that works on behalf of its namesake watershed, which includes all water sources from high in the Elk Mountains and the Fryingpan basin that confluence with the Colorado River in Glenwood Springs. The Roaring Fork Conservancy works year-round to provide the best science possible to decision makers and the public, taking real-world water issues and interpreting them at various levels. This includes understanding snowpack and how much water goes where, getting to know the macroinvertebrates that live in our streams and working on policy issues. “Our mission is to inspire individuals to explore, value and protect the Roaring Fork watershed,” said Roaring Fork Conservancy education and outreach coordinator Liza Mitchell. If people value the water, they are more likely to work together for its protection, she added. “Right now, we are at 61 percent of normal — that’s the snow-water content in the snowpack,” Mitchell said. The numbers are compared to a 30-year rolling average, from 1980-2010. “So it does not include the past eight years in that average. 2012 was a pretty dry year; in relation we are sitting just higher in terms of snowpack at this time of year,” she said. The seasonal snowpack peaked around April 7 and has been decreasing since then. Some of that snowpack evaporates, some saturates the soil and the rest flows into streams and rivers. Most everything below 10,000 feet has melted, but there is still a high-alpine snowpack that, while well below average for May, is still to come down as the temperatures rise. According to Mitchell, the local ecosystem has evolved over millennia in a manner dominated by the snowmelt cycle. The ecological processes that occur during peak flow are of the utmost importance for the overall health of the rivers and surrounding environs. Peak flows can move rocks, which changes the substrate of the stream, knocking loose algae and debris from previous years. As the water pushes sediment downstream and clears up space between the rocks, the base of the food web can grow in those interstitial places. Macroinvertebrates are aquatic insects, at their juvenile or nymph stage. May flies, caddis flies and stone flies are most common in the Roaring Fork watershed. “If you never have those peak flows, flushing flows, then those areas build up with mud and suffocate the macroinvertebrates; without macroinvertebrates you don’t have trout; without trout there is no food for eagles and ospreys,” Mitchell said. Runoff also inundates the flood plains, bringing water to the riparian vegetation, which then provides shade to keep the streams cool. Peak flows also assist in scouring the river channel, creating a spawning habitat for trout. In 2003, water districts throughout Colorado, concerned about the issue, put funding toward the creation of the Center for Snow & Avalanche Studies, which among other tasks, researches the effects of dust on snow. While the impacts of dust deposited on snowpack can be found in other parts of Colorado, the southwest part of the state – and the San Juan Mountains in particular – are by far the most troubled by the issue. Windstorms out of the southwest pick up dust from deserts in parts of the Navajo Nation in northern Arizona and New Mexico and carry it to the mountain snowpack in the high country of the San Juan Mountains. When dust lands on snowpack, it speeds up the rate snow melts – think how much hotter a black car is than a white car, Straub said. On average, this process causes snowpack to melt off 25 to 50 days earlier than normal based on about 100 years worth of data. And, runoff can decrease by 5 percent because of water evaporating through plants and soils as well as snow turning to water vapor. Naturally, this causes issues for water districts in timing dam releases for ranchers, and it causes the loss of water supply for the Colorado River basin, which supports more than 40 million people and millions of acres of agriculture. In a study published in October 2010 for the Pacific Institute for Studies in Development, Environment and Security, researchers painted a grim outlook if the issue went unchecked. Researchers from the University of Northern Arizona published a paper in 2016 that looked back on periods of dust over the last 3,000 years. Medieval times, for instance, were associated with high levels of dust. “These records indicate the Southwest is naturally prone to dustiness,” according to the study. Add human-caused factors like climate change, overgrazing and poor water management, and the situation enters the realm of unprecedented. Since 2003, researchers at the Center for Snow & Avalanche studies have noted this increase. It is likely that the San Juan Mountains have the longest and most comprehensive study on the dust-on-snow effect in the country, Straub said. This year, for instance, the region has already tracked seven dust storms that left a layer of dirt on snow in the San Juan Mountains, and the season for dust storms isn’t over yet. The average amount of dust storms in a full season, which can last until late June, is about seven, data indicates. Bruce Whitehead, executive director for the Southwest Water Conservation District, which manages the waters of nine counties in Southwest Colorado, said there’s a consensus about the need to see how dust affects water in the West. A minor boost of snowfall in April helped to stave off more shortages for local farmers who rely on McPhee Reservoir, water officials said. As of this week, the forecast is still for full-service farmers to receive about 17 inches per acre, said Ken Curtis, of the Dolores Water Conservancy District, which manages the reservoir. But the final runoff amount will not be known until June, and it will be impacted in coming weeks by variables such as wind, precipitation, dust on snow and soil moisture. Overall, the spring runoff into McPhee is dismal because of a winter with barely 50 percent of average snowpack, Curtis said. It is thought that dry mountain soils from a dry fall are absorbing a lot of the water before it makes it to the river. According to the U.S. Drought Monitor, Southwest Colorado is in an exceptional drought, the most severe of five categories. When the reservoir fills during more average winters, farmers typically receive a full allocation of 22 inches per acre, enough for three cuttings of alfalfa. But significant carryover water from the previous winter’s above-average snowpack is saving farmers this year, Curtis said. “As far as runoff, we are getting close to the project’s worst year in 2002, but the difference this year is we have good carryover,” he said. Based on 30-year runoff data, average McPhee inflow is 295,000 acre-feet of water from the Dolores River Basin from April through July. This year, it is expected to be 62,000 acre-feet, or 21 percent of normal. In 2002, the reservoir received just 45,000 acre-feet, and farmers suffered more drastic shortages, receiving less than 50 percent allocation. For boaters, there will be no whitewater release below McPhee dam. Also, the Dolores River above McPhee will not run as high or as long this year. Peak flows from Rico to Dolores are coming early, and are not expected to reach more than 1,000 cubic feet per second, down from more typical peak flows of 2,000-2,500 cfs. Currently the river is running at 700 cfs at Dolores, but boatable flows are expected to end by before early June, instead of in late June or early July during more average years. The next chance for substantial moisture in Southwest Colorado is the monsoon season of July through September, when summer monsoons typically draw up subtropical moisture from Mexico. Montezuma Valley Irrigation has more senior rights than McPhee Reservoir, including a direct flow right on the Dolores River up to 700 cfs. The private company stores water in Groundhog, Narraquinnep and McPhee reservoirs and closely monitors water supplies to determine potential impacts to customers. A recent court case that upheld a new 900 cfs in-stream flow right on the lower Dolores River from April 15 to June 15 below the San Miguel confluence does not impact McPhee Reservoir, officials said. The in-stream flow rights are junior to McPhee Reservoir’s more senior rights so they have no impact on the local water supply. Decreed by the state for environmental purposes, the new Dolores River in-stream flows are only available when snowpack produces sufficient natural runoff to provide the 900 cfs. Longer-range outlooks for Lake Mead and the Central Arizona Project are increasingly grim due to this year’s bad runoff, the U.S. Bureau of Reclamation said Wednesday. The result is that the bureau is pushing hard for states in both the Upper and Lower Basins of the Colorado River to reach agreement this year on drought planning to ease the pain of future shortages, after negotiations have so far failed. The bureau’s new forecast for the river shows that the chance of a CAP shortage next year is almost nil, but in 2020, it’s over 50 percent. Looking farther ahead, the chances of a shortage for 2021 through 2023 exceed 60 percent each year, the bureau said. The CAP provides drinking water to Tucson and Phoenix. 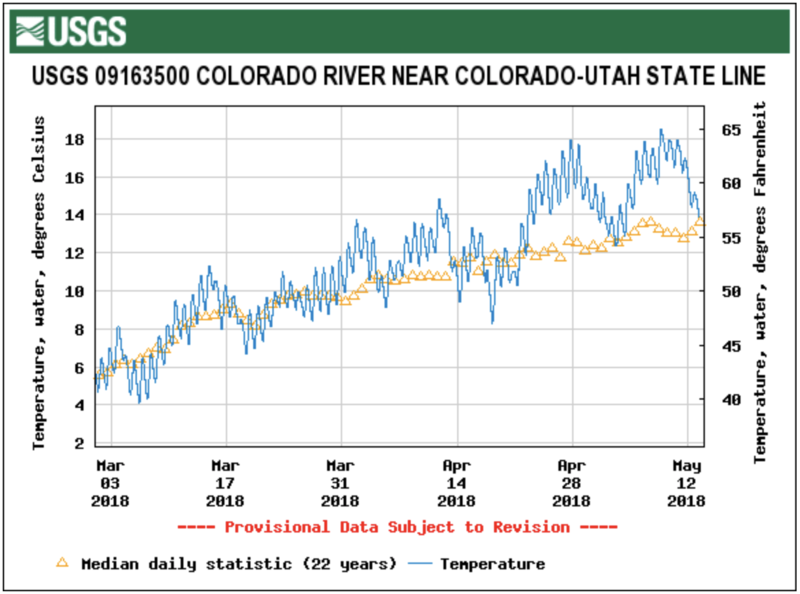 The gloomy forecasts are based on this year’s expected poor spring-summer runoff into Lake Powell at the Utah border from the Upper Basin states of Colorado, Wyoming, Utah and New Mexico. The most recent forecast, last week, was 42 percent of average runoff. A 52 percent risk of a 2020 shortage. Shortage odds of 64 to 68 percent in 2021, 2022 and 2023. The most likely shortage would cut CAP deliveries by about 20 percent. Those cuts would mainly slice water supplies to Central Arizona farmers and the Arizona Water Bank, a state program that recharges Colorado River water. Such a shortage will occur when Lake Mead drops below 1,075 feet at the end of a given year. Cuts would likely also affect the Central Arizona Groundwater Replenishment District, a related agency to CAP that buys and recharges river water into the ground to compensate for groundwater pumping that serves new suburban development. Starting in 2021, the odds are more than 20 percent of Arizona facing a more severe shortage, in which it would lose about 26 percent of its CAP water. That shortage would happen when Lake Mead drops to between 1,050 feet and 1,025 feet. Lake Mead sat at nearly 1,085 feet elevation at the end of April. It’s expected to drop to 1,079 feet by the end of December. The Lower Basin Drought Contingency Plan would require Arizona, Nevada and California to reduce their use of river water more than already required when the first shortages hit. The plan’s purpose is to prevent Lake Mead from dropping to catastrophically low levels over the coming decade. The plan’s approval has been delayed significantly. That’s in large part because of conflicts between the CAP and the Arizona Department of Water Resources over how this state’s share of the river’s water should be managed and who should manage it. The state water department and Gov. Doug Ducey tried to get the Legislature to pass bills this year to make conservation for the plan easier, but the Legislature didn’t go along. Last week, representatives of the three Lower Basin states met in Las Vegas to discuss river issues. At the meeting, Reclamation Commissioner Brenda Burman sought to get the CAP and the state water department to meet and settle their dispute, said Sally Lee, an ADWR spokeswoman, and Bart Fisher, chairman of the Colorado River Board of California. Last week, a new study in the peer-reviewed journal, Nature, also heralded troubling news. According to the authors, more than 90 percent of snow monitoring sites in the western United States showed declines in snowpack—and 33 percent showed significant declines. The trend is visible during all months, states and climates, they write, but are largest in the spring and in the Pacific states and locations with mild winter climates. To drive home the numbers, they noted the decrease in springtime snow water equivalent—the amount of water in snow—when averaged across the entire western U.S. is 25 to 50 cubic kilometers, or about the volume of water Hoover Dam was built to hold in Lake Mead. The March forecast for the Colorado River Basin remains “well below average.” Lake Mead, the largest reservoir in the United States, has already dipped below 40 percent of capacity and its “bathtub ring” is about 130 feet tall. As of Sunday, the lake’s water level was 1,088 feet above sea level. If it reaches 1,075 feet, that will trigger federal rules that cut the amount of water Nevada, Arizona and California can take. Meanwhile, water users in the three states, including cities like Las Vegas and Los Angeles, the Central Arizona Project, irrigation districts in southern California and tribes, are all keeping a close eye on Lake Mead—and trying to work out a drought contingency plan to avoid those federally-mandated cuts if the reservoir keeps dropping. “We are working with our partners, including our sister agency the Fish and Wildlife Service to determine when and how to use that water to benefit the Rio Grande silvery minnow and other endangered species in the area,” she said. The Rio Grande Silvery Minnow was listed for protection under the Endangered Species Act in 1994. Two years later, in 1996 about 90 miles of the Rio Grande south of Albuquerque dried. Biologists scrambled over the fish, environmental groups sued, political wars waged and water managers tried to figure out how to serve cities and farmers while keeping the fish from going extinct. For 15 years, the U.S. Fish and Wildlife Service (FWS) required water managers to keep at least 100 cubic feet per second (cfs) of water in the Albuquerque stretch of the river—even if it dried to the south, as it did many years, typically between Las Lunas and the southern boundary of the Bosque del Apache National Wildlife Refuge. Then in 2016, FWS pivoted. Under its new biological opinion for the silvery minnow, the agency said water operations in the Middle Rio Grande were not jeopardizing the fish’s survival. It stopped requiring flow minimums and instead expects Reclamation and its partners to manage the river to improve fish densities. Last year dealt water managers a good hand, Gensler said, but this year will be the opposite. And 2018 is shaping up to be similar to that notoriously-dry 1996. “I’m optimistic we will all come together and manage through it,” he said. River runner and conservationist Steve Harris lives alongside the Rio Grande above New Mexico’s major diversions. Right now near Pilar, the river is clipping along at about 500 cfs, he said.